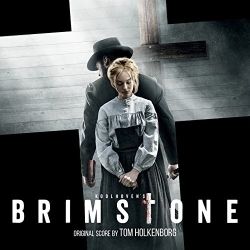 The film Brimstone was written and directed by Martin Koolhoven, edited by Job ter Burg, photographed by Rogier Stoffers and scored by Tom Holkenborg (also known as Dutch DJ Junkie XL). The cast includes Guy Pearce, Dakota Fanning, Carice van Houten, Emilia Jones and Kit Harrington. Tom Holkenborg's score is without a doubt a wonderful work, providing just what the film needs. Overall it helps to establish a grave and emotional mood, a kind of mood that crawls under your skin. By inspirational use of Bach he has creates a memorable and iconic theme for the character of the reverend. It's written for strings, sometimes accompanied by a choir. The morbid and religious tone of the theme can be heard throughout the score and is treated in different variations, sometimes merely hinted at. In the opening of the cue Retribution there is a particular nice low key rendition for an organ, supported by choir on the background. Perhaps equally strong is the theme of Liz, which is more refined in tone; ominous while embracing a feeling of pathos and a elegant, hopeful side. This sort of openly evocative and classical orchestral writing is combined with wonderfully dark and suspenseful, textural music, that together form a symbiotic whole. The composer work flows naturally from low-key brooding textures, interwoven with character-based material to moments of epic proportions. It's unsettling and evocative, powerful and memorable, unlike anything that Holkenborg has done before. Quite like the film, the musical achievement feels like a labor of love, a magnum opus if you will. It's a score that's so strongly connected to the film, while being a body of work that could easily stand on its own. 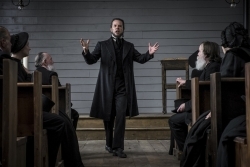 In February of 2009 director Martin Koolhoven contacted me while writing the script of Brimstone. Much alike the situation with Oorlogswinter, my help consisted of talking about film music and exchanging ideas. This helped him to be inspired during writing and also gave him a 'sense of direction' towards the kind of score he wanted in the end. Sometimes he asked for something similar to a specific score or a certain kind of music, while wanting to listen to scores he was already familiar with. A lot of music was sent back and forth. The development of the film took many years and I think we talked all the way up to somewhere into 2015. I will talk about this	process to give an impression. One of the first things he asked me if I could think of western scores that either have a more gothic or a rather postmodern sound, similar to scores for the Coen Brothers films. With that idea he mentioned Dee Barton's score to High Plains Drifter. He liked the eeriness and wanted me to help out exploring that kind of terrain. Other things included the search for scores with religious aspects and scores with a devilish atmosphere. Sometimes he would ask for scores he already knew that he felt were very inspiring such as There Will Be Blood (Jonnny Greenwood) and scores with a certain kind of atmospheric, textural sound by John Murphy, Trent Reznor and Cliff Martinez. Being a real movie buff, Martin also gained inspiration from films such as Charles Laughton's The Night of the Hunter and Cape Fear. He expressed an interest in their music as well, but not necessarily as inspiration for the kind of score he wanted. I remember who had once played Walter Schumann's score to The Night of the Hunter on a radio show in 2012 and once again in 2016, now alongside his musical influences for Brimstone. I think Martin has quite a lot of knowledge about film music. There are some composers that he truly admires and of which he expressed an interest in wanting to use them some day. Ennio Morricone, John Murphy (28 Days Later) and quite a few others are on top of his list. 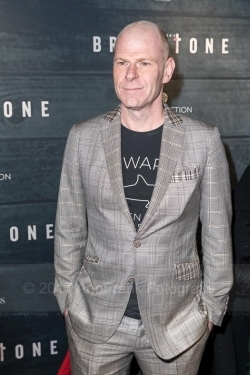 With Brimstone he had thought of hiring the Canadian composer Howard Shore, because Martin admires his work on Cronenberg's films very much. This was someone who he was very sure of, while still wanting to revisit some of his specific scores. The director also had his eye on some other composers. He wanted to find out a bit more about their music and their capacities. In addition to the ones he talked about I had offered him to take some other composers into consideration. Around the same period of brainstorming on the choice of a composer, he asked me about composers who could (still) write distinctive and striking melodies for a film. As examples he referred to Michael Nymans The Piano and composer Morricone. He really wanted music with memorable melodies that worked for a film, unaffraid to be noticed and that could be whistled as you walked out of the cinema. In the process of considering some composers weighed heavily into making a choice. The very last musical idea he proposed was the idea to build the score aound an aria of an opera, or a score inspired by an aria and wanted know if anyone had done this before. It was an interesting idea, but not something that made it onto the final score. Holkenborg was a composer who had been on the director's mind for years. Martin hadn't made his final choice and was very keen to talk to Tom and so later into 2015 he had presented the script to Holkenborg, who accepted the offer. The news was made public on the 20th of November 2015. The director and composer had a lot of talks and started to think about the kind of score they wanted. From their talks and exchanging music and ideas they gained inspiration for developing what was to be the score in the end. One of the things they discussed was Bach. The piece 'Passacagliain C minor' was the biggest and direct inspiration on the melodic core of the score. Other inspriring works that the composer thought of were Max Richter's The Leftovers, Herrmann's Fahrenheit 451 and On Dangerous Ground, while Martin chose, amongst others, Gorecki's 3th Symphony. The score was recorded in Galaxy Studios in Brussels on the 20 and 21th of March 2016. The orchestra consisted of members of the Brussels Philharmonic Orchestra and a small numbers of Dutch musicians, who all together were credited as the Galaxy Symphonic Orchestra. Gavin Greenaway, who had worked on several of Tom's works, conducted the orchestra and the Flemish Radio Choir was there to asssist. Beyond these elements of score Tom made use of electronics. JOEP: You have invested many years in the making of the film. When you started to write the script for Brimstone you already thought about musical ideas and inspiration. Can you enlighten us about the importance of music in the entire process of making the film? While writing I try to listen to music that can inspire me. Usually during editing I am looking for the temp track but this time Tom was on board so early - he started very soon in the process, during editing. So he actually helped us shape the movie instead of just scoring it. JOEP: Could you explain the reason for choosing Tom Holkenborg for Brimstone? He's a great composer and a fantastic person. I met him years ago through a mutual friend and since then we always said we should work together. Then he heard I was doing Brimstone and he said he wanted to do it, way before he had read anything and before I even thought about hiring a composer. When he finally got the script he was very clear: no matter how busy I am in Hollywood, I want to do this. JOEP: At a time, prior to hiring Holkenborg, you were searching for a composer who could deliver distinctive and striking melodies for a film score. The score to Brimstone certainly has stong, melodic music. Can you tell me something about how you and Tom worked on creating the melodic elements of the score? Tom was very happy to be allowed to write music that is supposed to be that strong. Many modern directors are afraid of strong melodies, but I'm not. Before he started writing we send music to each other that we felt was emotionally connected to the movie. A lot of that was Bach, so strong melody lines were always the aim. JOEP: What were the most the important things the music needed to reflect? It's not what it should reflect, it is what it should do. And it should evoke the emotions that go with the story and the characters. It should connect you to the persons on screen and make their journey an emotional one. JOEP: In March 2016 the music was recorded in Galaxy Studios in Belgium with the Galaxy Symphonic Orchestra. What had led you into using their services? Job ter Burg had recorded there before and was very enthusiastic about it. Tom also really wanted to do it there and then I should just go with their feeling. JOEP: Were there any changes made to the music during the post-production? Constantly, since he was part of the whole process. The music grew during the editing process. JOEP: The score of Brimstone is being released by Milan Records. On your previous film composer Pino Donaggio allowed you to select the music for a cd release of the score to Oorlogswinter. How was it compiled for your new film? I didn't select the music that made the soundtrack for Brimstone, but Pino let me name the tracks. Tom did the exact same thing. Check out the official website of Tom Holkenborg. 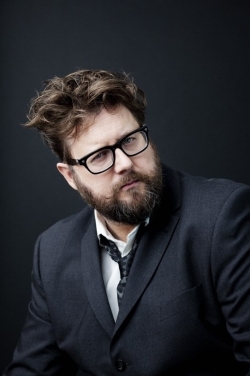 Read more about the scoring process for Oorlogswinter, an other movie by Martin Koolhoven. The music was composed by Pino Donaggio.